For a long as I've owned a computer, I've scoured the internet for free fonts to add. On my Mac, it's as easy as downloading the font, then dragging and dropping it into the Fonts folder. I've created custom invitations, labels galore, titles and journaling for my scrapbooking, and other word art for our home. What type of type do you like? 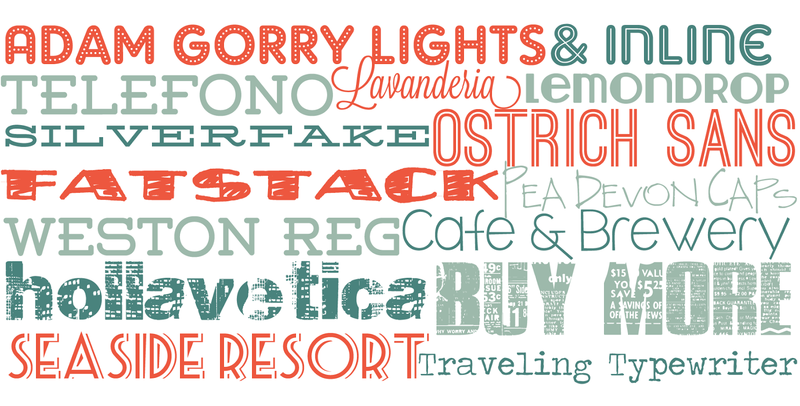 Hopefully these links will help you with your font love! When I'm on the search for a font, my go-to sites are dafont and Font Squirrel, where they are all free to download and updated often. Hongkiat.com wrote an article years ago about 21 free fonts sites (many are still current) and Free Typography is a blog that posts only about fonts. If you like handwritten fonts for your projects, you should certainly find something that suits your needs at the blog, Kevin & Amanda. Articles like these at Smashing Magazine and Awwwards provide large lists of fresh fonts, complete with links, and yup, also free. *As with any downloads off of the internet, please be careful before proceeding. I have used most of the above sites for my personal use and have experienced no adverse affects. Feel free to contact me if you have any questions! Great tip and thanks for the links, off to check them out! Thanks for the places to look for fonts - I was just thinking that I would like some new ones. Thank you for the links. I always love finding new fonts. Oooh, great sample choices and thanks for the links!